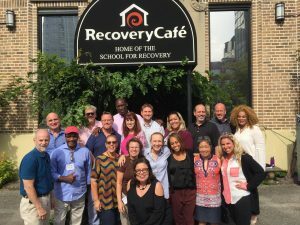 We were thrilled to host the Access to Recovery Federal Grant Statewide Directors from North Carolina, Missouri, Iowa, Connecticut, and Massachusetts in person, and Oregon and Illinois by phone for two days in August to share how Recovery Café’s model works. Cheryl Wilcox, a great friend to Recovery Café and the Washington State’s Access to Recovery Director shared about Recovery Café with other State Directors and after hearing about it, the Directors requested an onsite visit. During the final session several of the participants shared their desire to have Recovery Café’s in their state, identifying it as a missing piece in their continuum of Recovery Services. Enid Osborne, the Substance Abuse and Mental Health Services Administration (SAMHSA) Grants Officer, who helped arrange the trip, also visited Recovery Café Tacoma while she was here. She has been a champion for Recovery Café’s model at SAMHSA and it was wonderful to meet her in person. We are hopeful this trip will lead to many more communities of hope, healing and life transformation across the country. Of course we will keep you posted.